Spoiler alert: No rice in this recipe! Just good 'ole quinoa and my first time cooking with it. Turns out? It's delicious! To be honest, I was a bit skeptical about this whole quinoa thing (apparently pronounced keen-wah). I kinda thought it was another one of those "fad" foods that were over-hyped. Although, I thought that about blood oranges and I quickly became obsessed. Anyhoo, I saw Katie post this recipe awhile back and quickly pinned it. I even bought the quinoa right away. However I let it sit in my pantry thinking it wouldn't be that good. Oh, I was so wrong. John was too. I told him about this and he said, "Is this another thing your super healthy friends like?" (Here's looking at you Ally and Lindsey!) He was not excited about this dinner, but he trusts my cooking enough now. He ended up yelling, "Baby! It smells gooooood!" so many times that I lost count. It did smell goooood though. So when I took my first bite I was so pleasantly surprised and happy that I immediately realized I should have made more. Next time my friends, next time. Which will probably be, oh, on Thursday. *Rinse quinoa, drain and allow to dry (I used this time to chop my veggies!). Once dry, toss quinoa in a pot - without water. Toast on medium heat for 1-2 minutes, allowing it to dry out a bit more (which actually keeps it moist!). Add water to the pot and bring to a boil. Reduce to low, cover and simmer for 12 minutes. *While the quinoa is cooking, get your veggies ready. Saute onion and carrots in a pan until softened. (I just defrosted my peas and threw them in at the last minute). 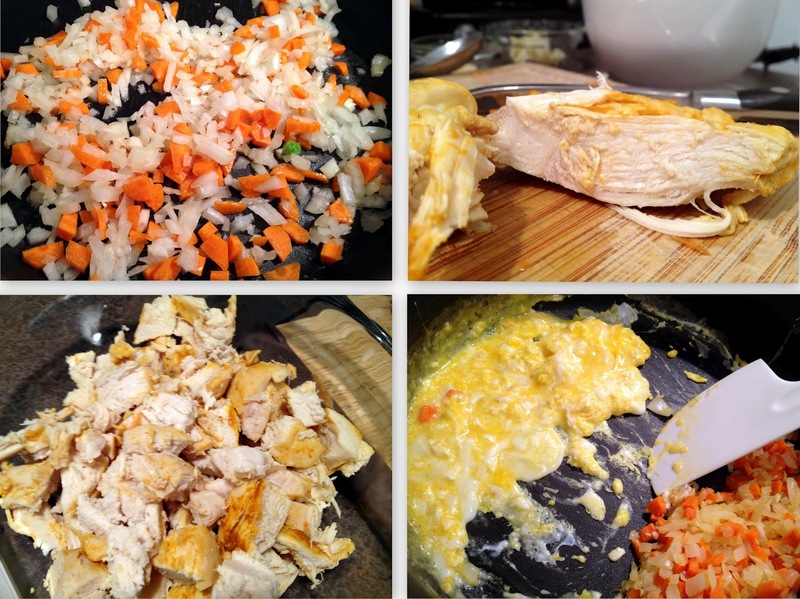 Push veggies to the side and scramble your eggs. Add garlic at the end and mix together. *When quinoa is ready, add it and chicken to the pan and mix well. Add garlic powder and soy sauce, plus salt and pepper to taste. Allow to fry for a couple minutes and serve immediately. Veggies + Eggs + Garlic | All mixed up!